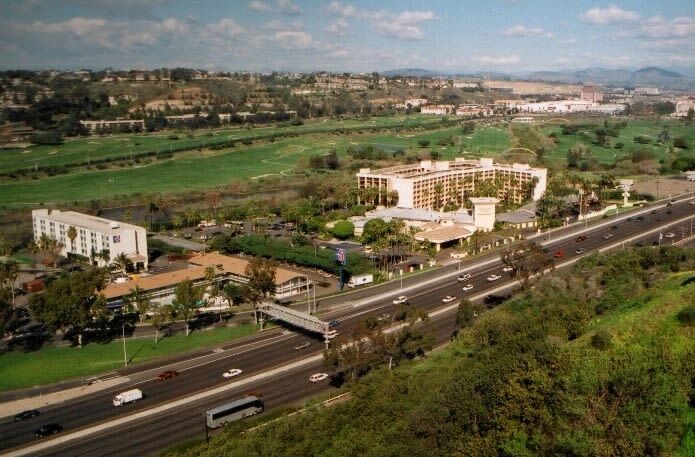 In 1953, Hotel Circle was named when the first hotel was developed in Mission Valley, and since then the area has become a hub for some of the best Hotels in San Diego. The convenience of the area is due to it being in the middle of San Diego with easy access to Interstate 8, as well as the 5 and the 805. There are plenty of fun things to do and see, and a lot of the area has an active nightlife for people that like to have fun in the evening. In the daytime, Hotel Circle has fast access to many of San Diego’s beaches via the highways. You may think that the area is just another Southern California beach town, but you will be surprised. There are many eclectic art-based neighborhoods and historical sites. With beautiful homes and great weather, taking a walk is a fun way to see many different architectural styles. This is due to the area having historical economic surges so houses and buildings were constructed in the fashionable trend of different times and this gives the area a unique vibe. Real estate is booming in the area, and people are buying to invest in their futures. There are tons of different places to shop, easy access to highways, and a climate so beautiful all year round you will decide you never want to leave. Are you going to take the leap and move to the Hotel Circle area of San Diego? Keep reading to learn more about how much it will cost to live there, places to visit, and some great moving strategies. Before you venture out to see the sites, you will want to find a place to move that is within your budget. You may want to consider transportation, housing, groceries, and other aspects of the cost of living. When it comes to Hotel Circle, the cost of living is the third highest in the nation with a 900 sq ft apartment costing around 2400 dollars per month. While this is a bit of a sobering fact, the economy is booming, and there are many jobs available. The unemployment rate is also one of the lowest in the country and the cost of living is lower than the rest of the San Diego area. Real estate is a smart investment but, you also want to find something within your budget. In Hotel Circle, the median price for a home is $455,000 with household income being around $67,000 per year on average. There are many great job opportunities available within the defense and military, international trade, and real estate industries, so it may be smart to try and find a job in the area before buying property. Once you get settled into your new abode, you can find so many fun things to do near Hotel Circle. Want to spend some time outside? Head to pedestrian-friendly Balboa Park, a 1,200 acre with many Spanish Colonial buildings constructed in 1915-1916. There are several museums lining the park like the Mingei International Museum (an international folk art museum) and the San Diego Museum of Art. Balboa Park’s other attractions include a Japanese Friendship Garden, Marston House, Botanical Building, and the San Diego Model Railroad Museum. If you are more of an animal lover, check out the San Diego Zoo which houses more than 4,000 different animals. There are many cageless enclosures that simulate a more natural feel, along with man-made rainforest with waterfalls and tropical trees. Don’t forget to stop in and see the Giant Panda Research station where you may see newborn pandas. There are also quite a few military museums in the area. If you travel to Embarcadero, you can visit the USS Midway, a 1945 aircraft carrier. There are many fighter jets that sit on deck as well. If you head North of San Diego Bay, the Marine Corps Recruit Depot Museum is a cool spot to learn about some military history along with an exhibition on Navajo Code Talkers from World War II. Not far from Hotel Circle in Mission Bay is SeaWorld, perfect for education and theme park enthusiasts. Be sure to see Shamu the killer whale, or check out the penguin and manatee habitats. Whatever you want to see, Hotel Circle is a great place because it is right in the center of it all. Hotel Circle is a great location and has something to offer just about anyone. If you love the idea of having wonderful weather all year round, and fun things to do, you may have discovered the perfect place to live. While the cost of living can be a factor in choosing exactly where to live, there are many benefits and job opportunities that outweigh the negatives. Regardless of if you move into an apartment or buy a home, A-1 Self Storage can help you. Our facilities have retail areas that offer packing and moving supplies for purchase. Our friendly self storage professionals are here to help whenever you need it. They can help you find storage solutions for any size or budget. All A-1 Self Storage facilities have advanced security features to keep your valuables safe and great customer service to top it off! It doesn’t matter if you are moving locally or across the country, we can help you move into your new home. Come see us today at A-1 Self Storage Hotel Circle, 2245 Hotel Circle South and see how we can make your move the easiest one you have ever had! Call us or visit our website anytime and rent today.